For the benefit of anyone who missed the ‘Sky’s the Limit’ campaign launched last week by NATS (the partly privatised air navigation service), we are led to believe that the UK airspace is facing gridlock because the projected number of flights per year could be 3 million by 2030. But don’t worry folks, the problem can be solved by airspace modernisation or the Future Airspace Strategy (FAS). By designing new routes with steeper climbs and descents, and aircraft flying routes with greater accuracy (i.e. 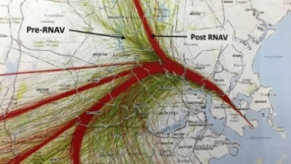 concentrated flight paths), NATS will be able to pack in more and more flights with a miraculous reduction in the number of people impacted by noise. There will also be the possibility of multiple routes to distribute noise. Who knew? The solution to the problems of noise and air pollution is to cram more and more planes into streamlined superhighways and, of course, NATS gets paid by airlines for air traffic services… kerching! Under this divide and rule approach, NATS keeps very quiet about the impact on those unfortunate enough to live under the concentrated routes whose lives and communities will be blighted. So, how’s it going elsewhere? In 2014, changes to flight paths were made as part of airspace modernisation. Some residents were so unhappy they took the Government to court over the changes and Gatwick Area Conservation Campaign wrote to MPs asking for a change in the law, to provide compensation to residents where they have been adversely affected by new flight paths. The Land Compensation Act 1973 provides compensation for people whose houses are devalued (according to a surveyor’s report) by the building of a new runway but not by new flight paths based on existing runways. In 2011, a 4th runway was opened adding new flightpaths and making changes to existing ones. Immediately people began protesting as the noise stopped them sleeping, prevented them enjoying their gardens, and their homes lost value – some by up to 40%. Every Monday evening for the last four years, between 600 and 3000 residents march through Terminal 1, banging and chanting. Airspace modernisation and concentrated flight paths introduced at Boston, Charlotte, Chicago, New York, Phoenix, San Diego, San Francisco, Seattle and Washington DC have resulted in lower, louder planes and many unhappy residents. The FAS has now been delayed while a new airspace and noise policy is developed. Aviation companies are trying to panic the Government by insisting time is running out. This is nonsense. The Government needs to stop, take stock and remember that its legally binding emissions commitments mean that aviation demand must be managed rather than increased. There is considerable evidence that aircraft noise affects cardiovascular health, mental health and impacts children’s learning. What sort of world do we live in when children in schools round Heathrow must shelter in earthquake huts in their playgrounds, to avoid the deafening roar of aircraft? The demand of frequent flyers for more choice and cheaper flights cannot be justified at the expense of our right to breathe clean air and to sleep undisturbed by aircraft noise.